The U.S. government printed more banknotes in September than in August, marking a fourth consecutive monthly increase, according to newly released figures from the agency responsible for manufacturing American currency. 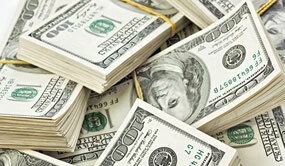 At more than 1.18 billion notes worth over $65.7 billion, both the quantity and value more than doubled the totals from the prior month, data released Wednesday by the Bureau of Engraving and Printing (BEP) shows. Last month the BEP ran the spectrum. The bureau produced $1s, $5s, $10s, $20s, $50s and $100s whereas no $10s, $20s, $50s were printed in August. In month-over-month comparisons, the quantity of banknotes increased 100.9% while the total dollar value jumped 105.4%. The biggest gains came from the over 615 million in $100s that summed to more than $61.5 billion. After delays due to production issues, these newly redesigned $100s will begin circulating on October 8, 2013. The BEP produced millions of star notes in denominations of $5s, $10s, $20s and $100s. These are referenced by the "*" designator in the above money production charts. Star notes are replacements for misprinted notes or certain serial numbers, like 000 000 000. Money collectors generally find them more desirable since they are harder to find. 10 years of research, great..!! , a well planned security measure 3D blue security ribbon and a bell and inkwell image which the reserve says are difficult to forge.